I don't want to admit it, but no, not a lot of progress on this. No long vacation excuses this time, just busy with life. What can I say? Set the main storyboard in the info.plist - I had done this. You can build up window content by using content segues to multiple view controllers. I didn't have a need for this yet, but I'm sure it's coming. Control-Drag directly from a menu or button to a window content view. This will produce a segue to the view controller. Easy and useful. The host view controller receives a method call prepareForSegue:sender: before the window appears for the segue. I'm not using this because there doesn't seem to be a way to associate the document window for this action when it appears on the application menu. So, my main question became -- how does all the other document stuff work? When you select File / Save, how does that get to the NSPersistentDocument class? Turns out, it uses a basic target/action to the First Responder. I just had to figure out is how to add my action method for my modes window to the First Responder. That turns out to be easy. Select the First Responder icon of the main menu. Then, use the Attributes inspector, and you'll see a list of User-Defined actions. The weird thing is, though, once you've defined them, they disappear from this list. No matter, just add an action, then edit it to be the method name you want. Then wire it up to the menu with control-drag as before. Implement the method anywhere in the responder chain. I implemented this in my document class. And my mode window comes up correctly, and I have a unique instance of it for each document. Cool. Next is the hard part -- trying to figure out how to associate the managed object context of the document with the modes view controller. This is were it gets weird. The window controller has a property document which points to the document for that window. How you get to that value from the view controller is something I have not figured out yet. 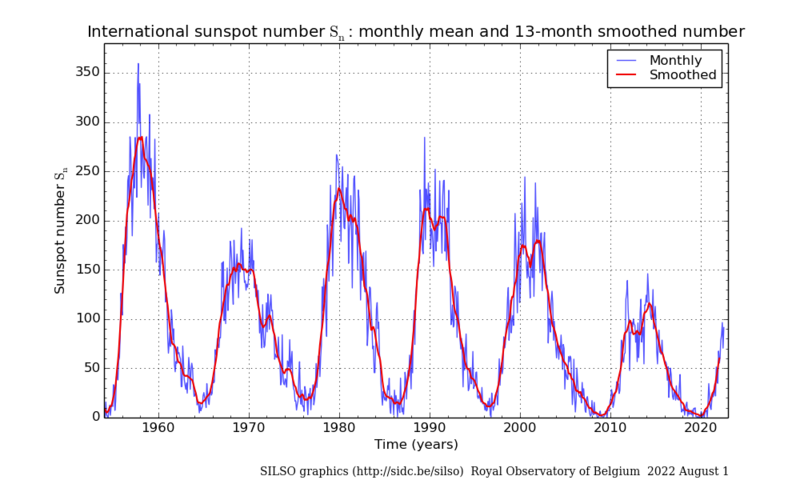 Smoothed SSN of the last six sunspot cycles. I mean, really. Look at this graph. It's pretty clear that Cycle 24 was barely half as tall as the three cycles before it. It wasn't even as good as Cycle 20. Smoothed SSN in Cycle 24 never made it over 82. The previous four cycles had several years over 100. And that was after a sunspot low that lasted a couple of extra years before Cycle 24 began an upswing. Now we're in that downward slide again. I know from experience that we're not seeing the end of the lull between cycles until the 2800 MHz solar flux gets down to 66 or 65. That's probably three years away. And then it will take a couple of years to build up. I'm thinking it will be about 2022 before Cycle 25 shows it's colors. In the meantime, propagation on 160m and 80m should be pretty good in the winter months for the next several years. I've told my wife, I want to be ready for Cycle 25. I want to have my antennas and station ready to rock when the sunspots come back.